Sleeve notes in English and German. 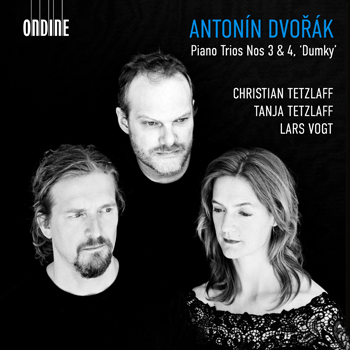 This fruitful collaboration by three eminent chamber musicians, Christian Tetzlaff, Tanja Tetzlaff and Lars Vogt, brings together two Piano Trios by the Czech master, Antonín Dvořák (1841–1904). During the last eight years, artists forming this unique trio have recorded eight albums of chamber music for Ondine with great acclaim, including some of the Romantic standard works. These two chamber music masterpieces by Antonín Dvořák express great emotional depth and dark passion. The two piano trios by Dvořák featured in this album have remarkable similarities as well as differences. Piano Trio No. 3, nearly symphonic in its character, hints to the world of Johannes Brahms, while the Piano Trio No. 4 (‘Dumky’) includes folkloric elements. The third piano trio might not only be considered as an homage to Brahms; it was written by the composer in 1883 shortly after the death of his mother which might well explain the sorrowful musical expression in the slow movement of the work. The ‘Dumky’ trio has a very unusual structure in its six movements. This intense and intimate work was written just prior to the composer’s departure to New York in 1891 and serves as a great climax for Dvořák’s series of piano trios. Christian Tetzlaff has been one of the most sought-after violinists and exciting musicians on the classical music scene for many years. He has an unusually extensive repertoire and gives approximately 100 concerts every year. Christian Tetzlaff served as Artist in Residence with the Berlin Philharmonic and appears regularly as a guest with such ensembles as the Vienna and New York Philharmonic Orchestras, the Concertgebouw Orchestra and London’s leading orchestras. Christian Tetzlaff has received numerous awards for his solo CD recordings. His recording of the violin concertos by Mendelssohn and Schumann, released on Ondine in 2011 (ODE 1195-2), received the ‘Preis der deutschen Schallplattenkritik’. Gramophone Magazine was choosing the recording of the Schumann Violin Sonatas with Lars Vogt (ODE 1205-2) as ‘Disc of the Month’ in January 2014. In addition, in 2015 ICMA awarded Christian Tetzlaff as the ‘Artist of the Year’. His recordings on Ondine with Brahms’ Trios (ODE 1271-2D) and Violin Concertos by Dvorák and Suk (1279-5) released in 2015 and 2016 earned GRAMMY nominations. His latest recording of Bartók’s Violin Concertos (ODE 1317-2) was nominated for the Gramophone Awards. Cellist Tanja Tetzlaff performs an extensive repertoire, including the staple solo and chamber music literature, and important compositions of the 20th and 21th centuries. Tanja Tetzlaff has played with leading orchestras such as the Tonhalle Orchestra Zurich, Bayerischer Rundfunk, Konzerthausorchester Berlin, Deutsche Kammerphilharmonie Bremen, Royal Flanders Philharmonic, Spanish National Orchestra, Orchestre Philharmonique de Radio France, Orchestre de Paris and Cincinnati Symphony Orchestra, and collaborated with conductors such as Lorin Maazel, Daniel Harding, Philippe Herreweghe, Sir Roger Norrington, Vladimir Ashkenazy, Dmitri Kitajenko, Paavo Järvi, Michael Gielen and Heinz Holliger. Chamber music also plays a significant part in her career, with regular appearances alongside Lars Vogt, Leif Ove Andsnes, Alexander Lonquich, Antje Weithaas, Florian Donderer, Baiba and Lauma Skride, and her brother, Christian Tetzlaff, and with her duo partner Gunilla Süssmann. In 1994 Tanja founded the Tetzlaff Quartett, with Christian Tetzlaff, Elisabeth Kufferath and Hanna Weinmeister. Lars Vogt was appointed the first ever “Pianist in Residence” by the Berlin Philharmonic in 2003/04 and enjoys a high profile as a soloist and chamber musician. His debut solo recording on Ondine with Bach’s Goldberg Variations (ODE 1273-2) was released in August 2015 and has been a major critical success. The album’s tracks have also been streamed online over 6 million times. Lars Vogt started his tenure as Music Director of the Royal Northern Sinfonia in September 2015. Lars Vogt was nominated for Gramophone’s Artist of the Year award in 2017. His most recent recording on Ondine, Beethoven’s Piano Concertos Nos. 2 & 4 (ODE 1311-2), received Gramophone’s Editor’s Choice in May 2018.